Deb's Cup of Tea: Cats are another form of liquid. This isn't my saying. I purloined this from Carole's friend, Phillip. His family got an Abyssinian, Cleo, who was all legs and a tail when she was little. I don't think I had seen a more lithe cat. If she didn't want to be held, she seemed to pour herself out of your arms. This is a perfectly Pilchard-sized box. Isn't she cute? I had a bunch of clan stuff in this box and have consolidated that down to a smaller box. 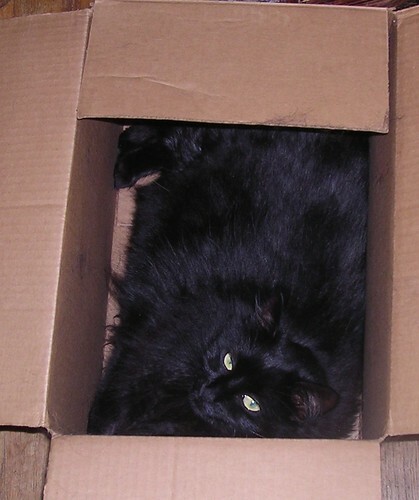 Pilchard has taken to this box and, if I can't find her, I'm trying to remember to check this box. At night, when the lights are off in the living room, there is almost no way to tell she's in the box without reaching in. In spite of her size, I watched her pour herself off the deck yesterday, much to my consternation. It was a wonderful day and I thought we could sit on the deck for a couple of hours. I'm almost through with the Scottish ghosts book so I would read and they would sun themselves. We'd all get some fresh air. I put the kid gate across the steps leading off the deck and sat down in the shade of the house. Mija came out, sniffed around and decided she preferred to lie in the doorway inside the house. That's fine. Pilchard came out, sniffed around and stuck her head through the slats in the deck. Now these are, admittedly, I didn't measure them, roughly 3-4 inches apart. They are too small for a child to stick their head through and get caught. While Pilchard can get her head through, the rest of her is too wide to fit through the slats, or so I thought. We hadn't been outside more than 4 pages in the book and she slid right through the slats and onto the ground. Fortunately, there were all these smells that needed to be smelled so she was preoccupied and didn't move. I scooped her up and inside the house we went. "Sorry. I can't trust you to stay on the deck. We can't be outside now," I said, not that she understood. So, I shelved the book and set about cleaning. I changed the sheets on the bed, started washing the rugs from the living room and then brought clean clothes up from the basement. I discovered this. 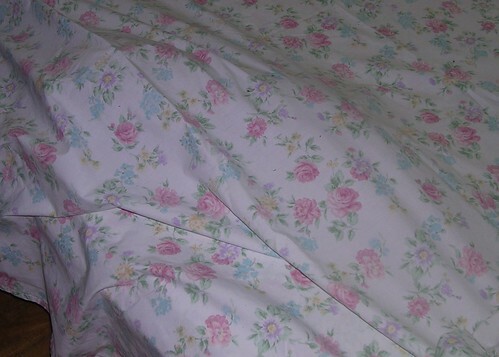 This is a lump under the sheets. Shakespeare and Half-Pint used to do this, too. Mija has climbed up onto the bed via under the sheet. I don't have a blanket on the bed because it's too warm. It's folded at the foot but I'll often sleep without covers in the summer. I just had to laugh. Typical cat behavior. I slowly picked up a corner and said, "Peek". She winked at me and batted at my fingers. We wrestled for a few seconds and then she jumped down. Ten minutes later, I found her curled up on top of the clean clothes I left on the bed to put away later. In the way? Sometimes. Single-minded or bull-headed? Yes, occasionally. But, I wouldn't have it any other way.